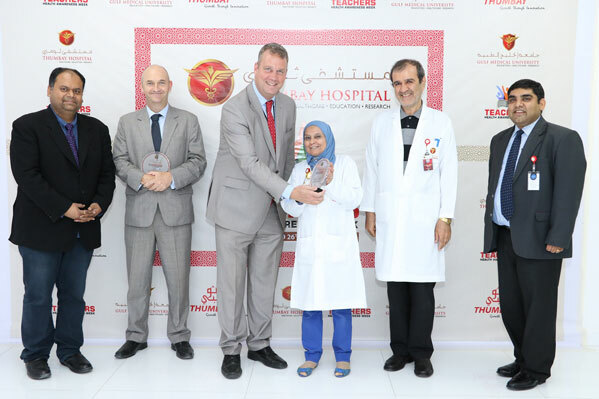 Thumbay Hospital – Dubai, part of the network of academic hospitals under Thumbay Group, launched the ‘Teachers Health Awareness Week’, a unique program being conducted across all Thumbay Hospitals and Clinics, to increase happiness and boost the morale, productivity and effectiveness of the teachers. 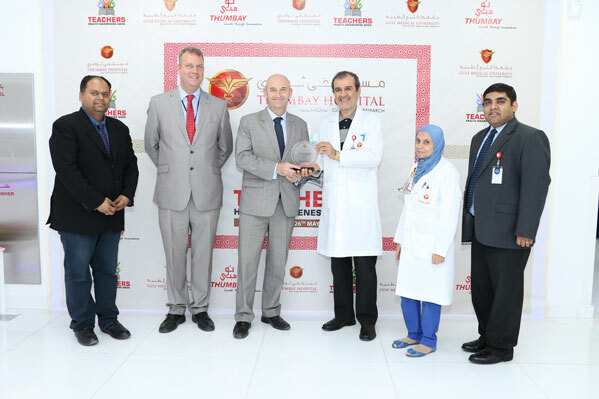 Mr. Dean Pyrah, Principal of Victoria International School of Sharjah was the guest of honor at the launch, which was held in the presence of Dr. Seyed Mohsen Mahmoodi – Medical Director and Orthopedic Consultant of Thumbay Hospital Dubai, Dr. Salwa Abdelzaher Mabrouk Ibrahim – Deputy Medical Director and Internal Medicine Consultant of Thumbay Hospital Dubai, Dr. Ashutosh Sood – Chief Operating Officer of Thumbay Hospital Dubai and Dr. Sameer Kumar – Assistant Administrative Director of Thumbay Dental Hospital Dubai. As part of the program launch, Thumbay Hospital – Dubai organized a unique educational program at Victoria International School of Sharjah, involving primary students, conducted with the aim of raising health awareness among the teachers and students. The program was appreciated by the school authorities for its effectiveness in encouraging cleanliness and hygiene among the students. ‘Teachers Health Awareness Week’ is being celebrated by Thumbay Hospitals and Clinics from the 21st to the 26th of May 2016. As part of the celebrations, they are offering a host of free benefits to teachers, including blood sugar, blood pressure and BMI checkups, ECG, stress-management workshop, exercise demonstration for chronic neck and back pains, mammogram and teeth scaling & polishing. Participants also get free consultation with GP, Cardiologist, Psychiatrist, Orthopedic Surgeon, Gynecologist and Dental Specialist.